Home automation is going to be huge in just a few years and home energy management will play a major part in its growth. 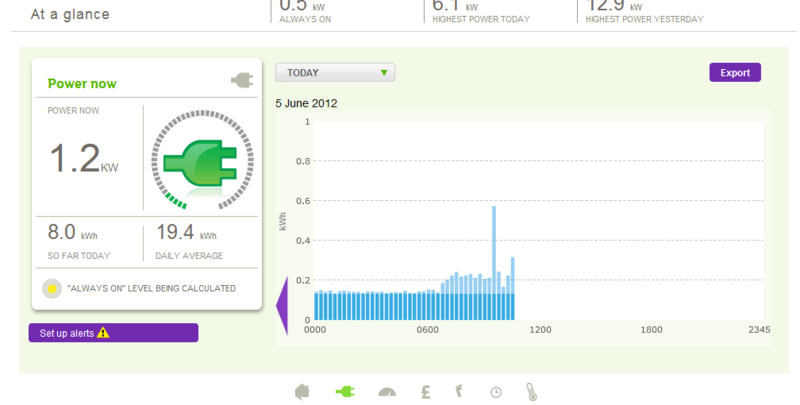 I currently have an ‘automated home’ in terms of lights, cameras, door sensors etc all using a technology called Z-wave. I wanted to include an energy monitor into this system, but was bitterly disappointed with the devices that are available and compatible with my current system. 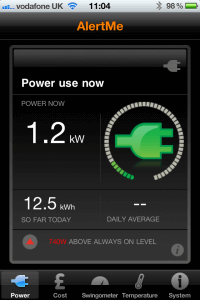 A couple of weeks back, I went beyond Z-wave and purchased the Alert Me energy monitor that uses the Insteon standard. It only recently arrived in the UK and for £50 it seemed worth the risk. When it arrived, my first impressions were very positive. This is a well packaged and cleanly designed system. When you unpack the various components – and there are four parts – a hub to connect the system to your broadband, an energy monitor, a cuff for your power supply, and a display. The display is a nice addition (although it is monochrome and not the colour display shown above) – their web site states that this is a ‘free’ addition to the pack. You don’t actually need it as everything you do will be on the AlertMe.com web site or via the iOS apps. It is easy to configure – just follow the steps on the web. 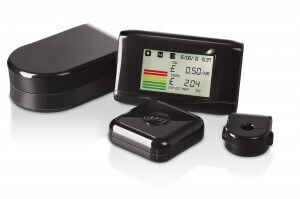 I had some problems with the energy monitor – first figuring out how to open it and activate the batteries and then getting it connect to my system. I was pretty impressed with AlertMe’s support – they responded fairly quickly and I was up and running in no time. The heart of the AlertMe system is the dashboard on their web site. All the information being collected is uploaded to the “cloud” and into your AlertMe account. You can see how much electricity your home is consuming, how that compares with how much you normally consume and how much you consume compared with the UK generally. 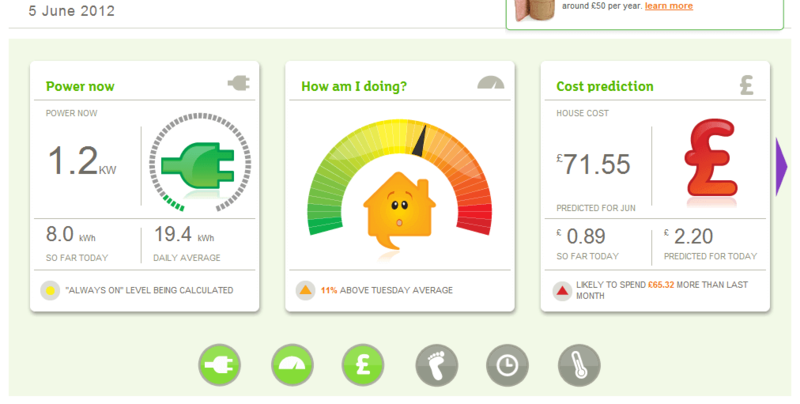 You can set the amount that you are charged by your electricity provider and so you can also see how much you are currently spending on electricity. 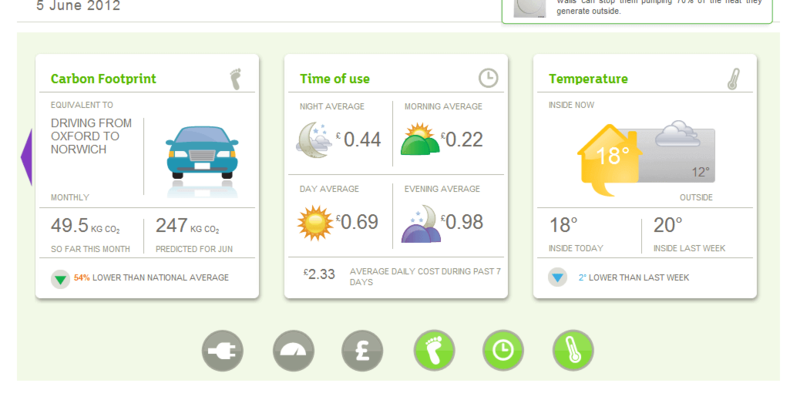 They have some nice charts that also allows you to see your “carbon footprint” and to assess your energy consumption by time of day. 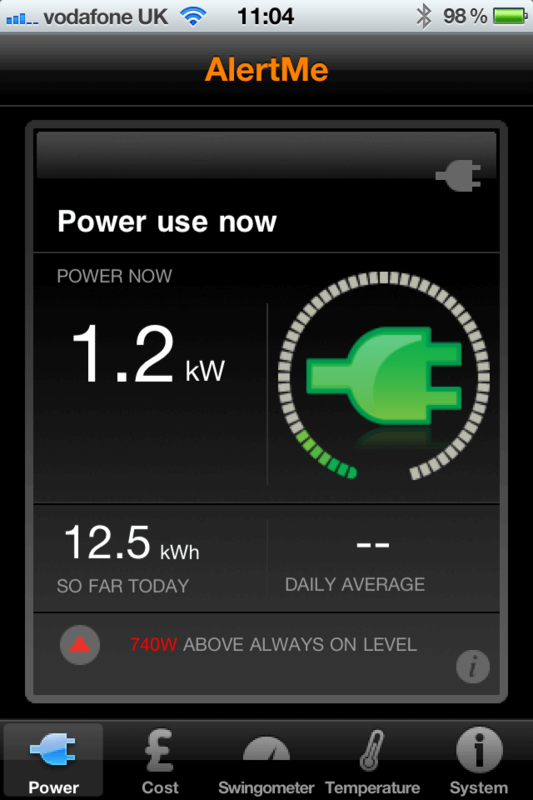 You can also monitor how much energy your house consumption using your smartphone (iPhone,etc) and access a subset of their dashboards from anywhere you are. You can set alerts – which I guess you would expect from a company called AlertMe. So if your electricity consumption exceed a certain level you can get an email. But be careful with setting these too low as you will get an inbox full of emails as soon as you put the dryer on or perhaps an oven. I think the company had their sites set higher originally – perhaps on an overall home automation solution – because you can buy a door sensor, some plugs and a camera. 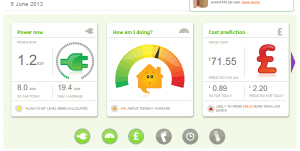 But personally, I would let other, better systems manage your home automation in that way.. they clearly decided to pivet on home energy and have even recently announced a massive partnership with British Gas. I’ve been using the system for a week now and I really like it. It is simple, clean and has given me a whole new level of understanding about how we consume electricity and how much some appliances can consume when switched on – the lights in our Kitchen for example chew up 800 watts and the tumble dryer is something like 1.2kW. As the old saying goes – “what gets measured gets done” – and I think devices like this will go a long way to help people become more aware of their “footprint” and will really help them become more energy efficient over time. For £50, I highly recommend you get one and give it a go – you may even save more than that over the year.